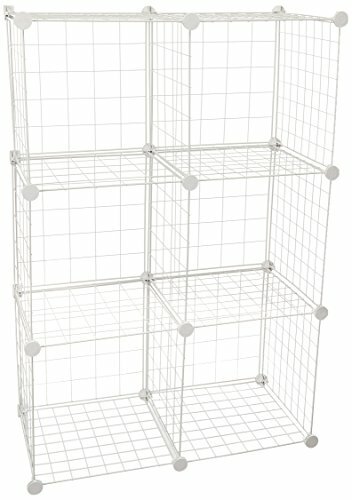 Honey-Can-Do SHF-03521 6-Cube Modular Mesh Stacking Storage Cube, White, 6-Cubes. Dimensions: 30.25 in L x 14.5 in W x 44.75 in H (76.8 cm L x 36.8 cm W x 113.7 cm H) white coated wire cubes - 6-cube. Set of 6 storage cubes in black are easy to assemble and snap-together. Coated steel wire is heavy gauge for durability and sturdiness. Unlimited configurations allow you to combine multiple cubes. Measures 30.25 in L x 14.5 in W x 44.75 in H. Home organization made easy. If you have any questions about this product by Honey-Can-Do, contact us by completing and submitting the form below. If you are looking for a specif part number, please include it with your message.